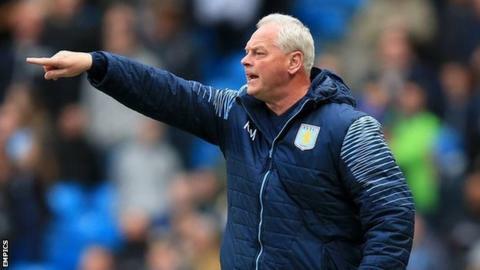 Confidence is becoming a "big issue" at managerless Aston Villa but it remains a great job for the right person, says caretaker boss Kevin MacDonald. MacDonald, 54, was put in temporary charge after Tim Sherwood's sacking and oversaw their 2-1 defeat by Southampton in the League Cup on Wednesday. "Confidence is a big issue. Nobody likes being bottom of the league," MacDonald told BBC Sport. "The players are hurting for Tim but we can't wallow in self pity." Sherwood was dismissed on Sunday after eight months at Villa Park with the club bottom of the Premier League. Former Lyon coach and ex-Arsenal defender Remi Garde is the favourite to take over. "It's definitely a big job because we're bottom of the league, but we've got some good players and it's a well-run club," added MacDonald. "Once we get the first win it'll be like a snowball - it'll get bigger and bigger. It would get us all going - whether that's me or someone else. "If I'm in charge on Monday (at Tottenham) and we win, that'll set everything going again." Joined Villa's coaching staff in 1995 and helped to develop Gareth Barry, Lee Hendrie, Gary Cahill and Gabby Agbonlahor. Took charge of the first team after Martin O'Neill's departure in August 2010, winning two of his seven games. Had short spell as Swindon manager in 2013 and returned to Villa as Tim Sherwood's number two in February. Placed in charge of Villa's Under-21 set-up after being replaced as Sherwood's assistant by Ray Wilkins.